The word “pirog" (pie) derives from the old Russian word "pir" (feast), which suggests that every important meal in Russia traditionally involved pies. Do you want to surprise your guests with a unique Russian dish? It's easy as pie. This is an old name for pies made from leftovers. If there was some fish or meat left from the previous night's dinner (they used to be called vekosh), which no longer looked very presentable but which it would have been a shame to throw out, a prudent housewife would make some dough, stuff it with all the leftovers, put it all in the oven, and get a wonderful new dish for lunch. In many ways, this traditional Russian pie is not unlike Italian pizza. These are small triangular pies made of stiff dough fried in sunflower oil with a filling made of cheese, eggs or jam, which was put only in one of the corners. Sieve the flour and mix the dough by adding water, a tablespoonful of oil and salt. Leave the dough for half an hour. Then roll out the dough thinly, cut out flatbreads, add the filling, form the flatbreads into triangles and crimp the edges, then deep fry them. The Russian version of deep frying was called pryazheniye. In it, the food was not floating in oil but was cooked in a frying pan, half-immersed in heated oil. In Estonian and Finnish, porkan means carrot. In parts of Russia bordering on Finland and Estonia (for example, the Pskov and Novgorod regions), a rye or a rye-and-wheat pie stuffed with carrots with hard-boiled eggs was called porkannik or borkannik. 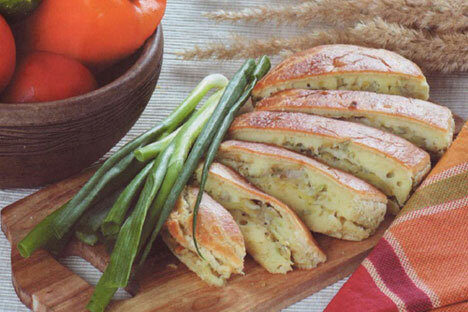 Yeast-leavened dough is stuffed with boiled and fried carrots, onions, and spiced with cumin and dill. Gubnik is a wonderful mushroom pie originating from the Pskov Region in northwest Russia. It is also known as ryzhechnik if cooked with the Lactarius deliciosus mushroom, commonly known as the saffron milkcap (ryzhik in Russian). It is usually cooked during the mushroom picking season, when there is no shortage of fresh mushrooms. Prepare yeasted dough, leave it under a wet towel for three hours, kneading a couple of times. The filling is cooked in a large frying pan: pickled or fresh mushrooms (pickled are tastier) are fried in vegetable oil with onions and black pepper. When the filling is added to the dough and edges are crimped, puncture the top of the pie in several places to let the steam out. Mix 500 g of wheat flour, two glasses of warm water and 40 g of yeast. Leave it to rise in a warm place for 30 minutes, then add another 500 g of flour, one glass of vegetable oil and one teaspoonful of salt. Mix the dough until it no longer sticks to your hands, put it into a bowl, cover it with a wet towel and leave in a warm place for three hours. During that time, break it down twice. While the dough is rising, prepare the filling for your gubnik. In a large frying pan, heat four tablespoons of vegetable oil, add five chopped onions and fry them till they turn golden, then add three glasses of chopped pickled mushrooms and black pepper to taste. Mix well and leave to cool down. Roll out the dough into a big oval, put the filling on one side of it and fold the other half over it, crimping the edges. Prick the top of the pie with a fork in several places to let the steam out, brush on top with a coat of very strong black tea and bake your gubnik on a buttered baking tray in an oven for 40 minutes at 180 degrees. These days a thinly rolled pan-fried pie made of leavened dough with a filling of cottage cheese or mashed potatoes or pumpkin is usually called an Adyg or Ingush pie. Variations on the chapilg are popular among many peoples of the Caucasus and are considered to be a national dish and a national treasure. However, historically, this pie originated as part of Russian cuisine and made its way to the Caucasus along the rivers Kuban and Terek. Sieve the flour into a big bowl, make a funnel and pour in one teaspoonful of salt. Add one teaspoonful of bicarbonate of soda to warm the kefir and stir. Pour this mixture into the flour and mix with your hands. Cover the dough with a towel and leave to rest for 20-30 minutes. Divide the dough into small balls and flatten them until they are 1 cm thin. Put 2.5 tablespoons of filling into the middle, crimp the edges, forming a ball with the filling inside, then flatten it with a rolling pin and place in a dry heated frying pan, and cover with a lid. Fry for 2.5 minutes on medium heat on one side, lift the lid, turn the pies over and fry the other side. Put the cooked pies on a plate and cover with a towel. After the last one is ready, pour water into the pan, boil it and quickly dip the pies into the boiling water. Then place them on a buttered plate, generously buttering the chapilgy on both sides. First published in Russian in Russkaya Semyorka magazine.